To that end, Mahindra committed all of Mahindra Rise’s companies to setting science-based emissions-reduction targets, which aim to limit global temperature rise to 1.5-2 degrees C (2.7-3.6 degrees F), the level scientists say is necessary for preventing the most disastrous of climate impacts. He also called on 500 other companies to commit to set science-based targets by the Global Climate Action Summit in California in September. “It’s the one way in which every company in the world can find a quantitative roadmap in how they’re going to contribute to meeting the Paris Agreement goals,” Mahindra said. So far, more than 330 companies have committed to science-based emissions-reduction targets as part of the Science Based Targets initiative. Other panelists shared Mahindra’s belief that what’s good for the climate is good for business. Still, business leaders agreed that what’s really needed to shift the world firmly toward a low-carbon economy is government action. Policy can push investment into greener infrastructure, the same way policies of the past, such as fossil fuel subsidies, helped create the high-carbon economy of the present. This year is also a prime one to watch for policy action at the national level. As part of the Paris Agreement on climate change, every country in the world committed to review and ratchet up their national climate policies every five years, beginning in 2020. 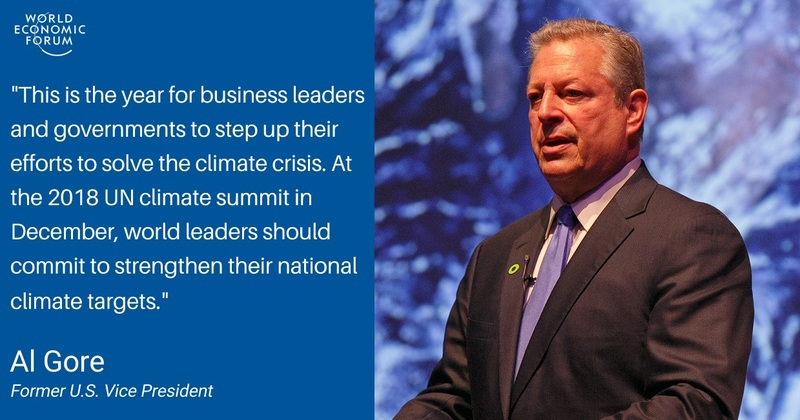 Gore said that at the UN climate summit in Poland this December, world leaders should commit to strengthen their national climate targets.